Every Who Down in Whoville Liked Christmas a lot... But the Grinch,Who lived just north of Whoville, Did NOT! The Grinch hated Christmas! The whole Christmas season! Now, please don't ask why. No one quite knows the reason. It could be his head wasn't screwed on just right. It could be, perhaps, that his shoes were too tight. But I think that the most likely reason of all, May have been that his heart was two sizes too small. This Christmas, I was determined to find a Christmas cookie recipe that was super quick and easy, and tasted like it took hours to complete. I hatched a devilish plan to concoct the cookies out of not cookie batter, but cake batter...from a box. That's right. These 'homemade' cookies are made with just three ingredients: boxed vanilla cake mix, vegetable oil, and eggs. All you have to do is stir it all together, roll the batter into balls, and bake. I made tiny hearts out of red fondant and secured them to the cookies with a dab of icing gel I had leftover; though if you don't have any fondant on hand, I've seen candy hearts and heart shaped sprinkles that will do the trick too! My own little Grinch wanted to join in on the fun. 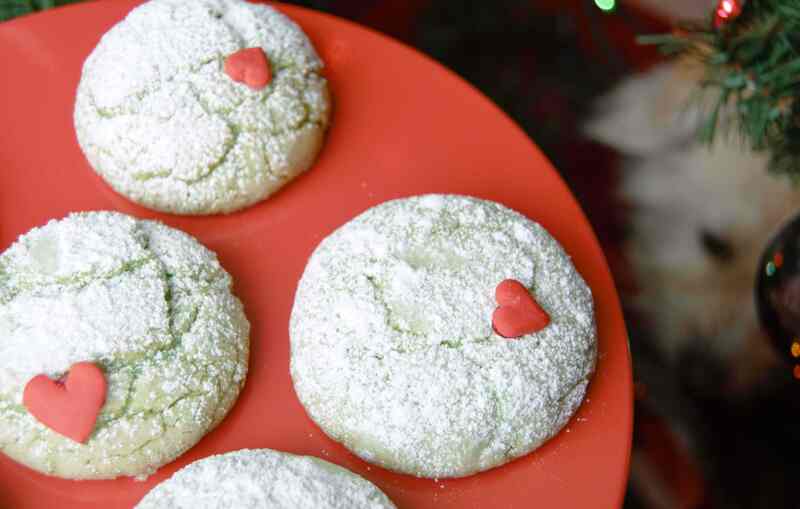 These cookies are so simple, yet so delicious - and definitely guaranteed to disappear. 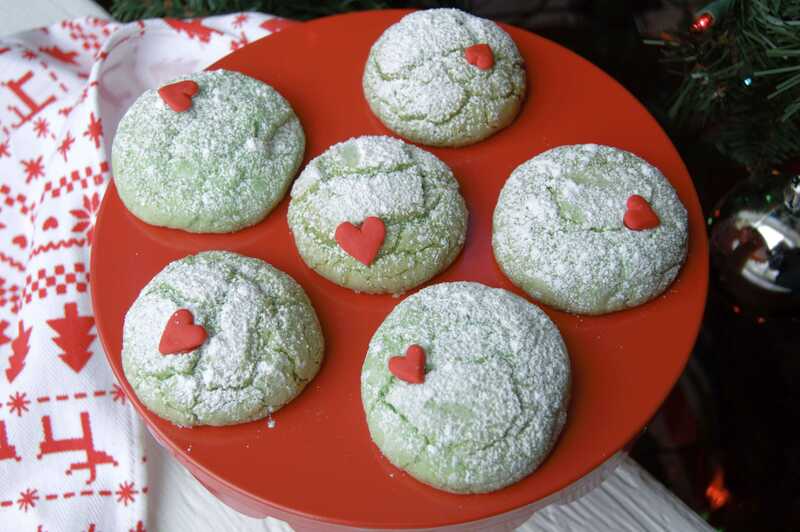 Serve the cookies to the Grinch in your life to show them the true meaning of Christmas! Then the Grinch thought of something he hadn't before! "Maybe Christmas," he thought, "doesn't come from a store." "Maybe Christmas...perhaps...means a little bit more!" And what happened then? Well...in Whoville they say, That the Grinch's small heart Grew three sizes that day! Preheat the oven to 350 F. In a small bowl, stir together the boxed cake mix, vegetable oil, eggs and food coloring until a smooth doughy batter forms. Scoop the dough into tablespoon sized balls. Roll the dough balls gently in your palms, then roll in powdered sugar until completely coated. Arrange the dough two inches apart on baking sheets. Bake for 12-14 minutes, or until the cookies are puffed up. They will look underdone but will continue to cook and firm up after being removed from the oven. Cool completely. 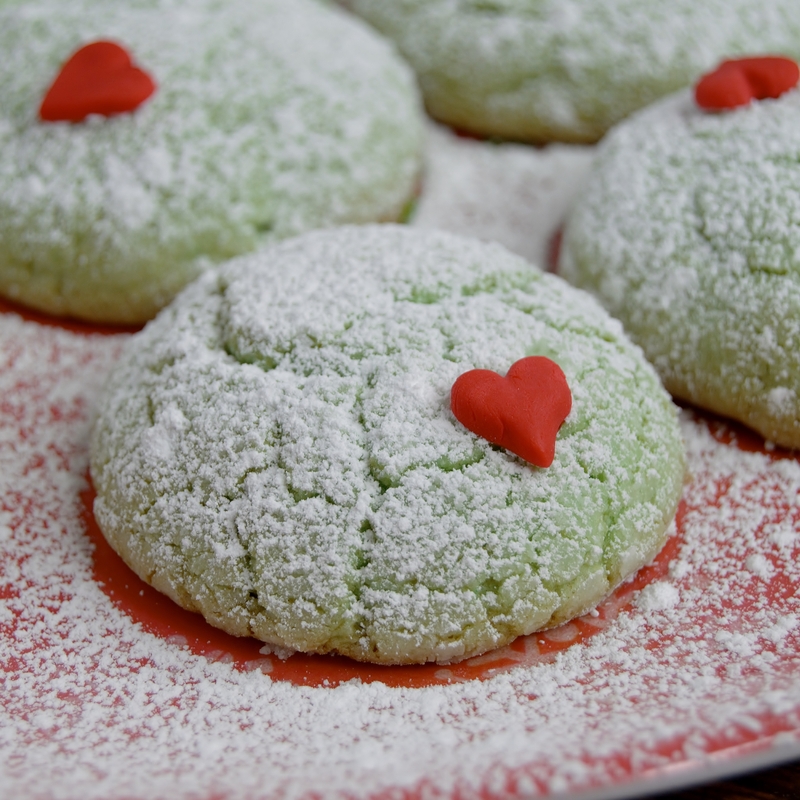 OPTIONAL: If using fondant, create the hearts, varying in sizes, while the cookies are cooking and cooling. Let the fondant dry. Dust the cookies with more powdered sugar through a mesh screen. Dab a tiny bit of icing or food gel onto the backs of the fondant hearts or sprinkles and press gently on the tops of each cookie. Serve to the Grinch in your life to show the true meaning of Christmas and enjoy!